If it costs too much to bring in customers, you’re quickly going to find yourself treading water. You congratulate your staff on the sale (keep it going! 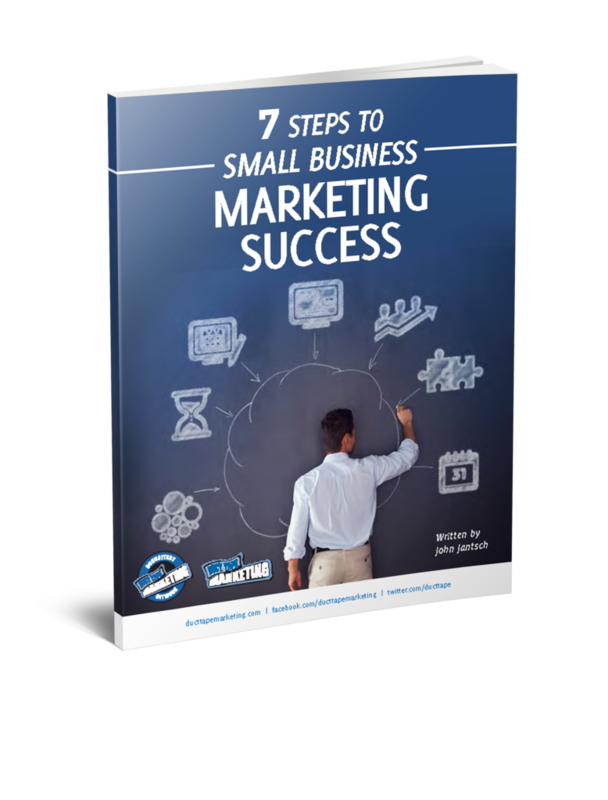 ), yet your marketing spends translates into zero net gain–or even a loss in some cases. Continue treading these waters and you’ll need a life vest. However, if you are able to minimize Customer Acquisition Costs (CAC), you’ll have a sustainable business that does more than stay afloat. First, it helps to determine what you can afford to spend on customer acquisition. The objectivity principle of accounting states that “You should use only factual, verifiable data in the books, never a subjective measurement of values.” Yet this can be tricky when determining CAC. If your business is in a growth stage, acquisition costs are lower because people are finding out about you from other new customers who are in something of a honeymoon phase with your offering. After a growth stage plateaus, CAC is higher. So, if you’re relying on data from your growth stage to determine average CAC, it won’t necessarily apply to where you are right now. The higher your Customer Lifetime Value is, the better off you are in terms of acquisition costs. The high value means they stick around and maintain a relationship with you. The rest of this discussion will center on low-cost ways to maximize lifetime value. Customers who come back help you sustain growth because they typically tell other people about you. Although you can’t put the words in their mouth, you can take a number of steps to make sure they don’t forget greatness. This will translate into word of mouth, which comes at absolutely no cost to you. Be attentive: Through email and social media, remind customers you’re there, that they need to re-subscribe, refill, etc. Nail all these basics, and if your product or service is good, they’ll be back. Furthermore, get a blog going on your website and post regularly so customers who are curious can get insight on your day-to-day activities and achievements. Take pictures and personal videos and post them on your blog and social media. Turn employees into valuable brand advocates by soliciting their involvement. Rewards points and free shipping are two examples of good incentives. With rewards, you can create user-generated campaigns. Simply offer discounts, freebies, or exposure in exchange for user-generated content. This can include videos, photos, social media posts, guest blog posts, and testimonials. Big-time social media users consume over five hours of user-generated content per day, and user-generated campaigns on social media are 20% more effective than regular ads. One highly successful (and highly publicized) example of user generated content comes from Chobani. 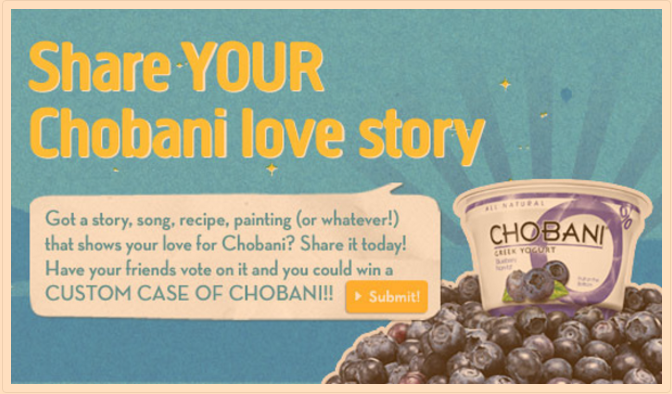 The Greek yogurt company asked fans to share their “Chobani love story”, and made it into a contest by soliciting votes in exchange for a free case of yogurt. Chobani used the content on the website, billboards, and social media. The campaign led to a 225.9% increase in revenue. User-generated content and incentivization give you plenty of chances to get creative. 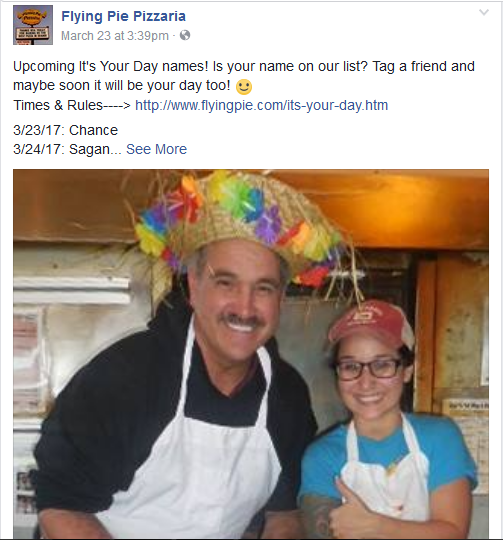 In my hometown, a local pizza restaurant called Flying Pie Pizzeria runs a campaign called It’s Your Day. This creates community engagement, word-of-mouth, and new customers who come in because a friend told them it’s their day (or they saw it on the restaurant’s reader board). The restaurant asks people to get involved on social media. And people post about their experiences, which increases the restaurant’s reach. This ongoing campaign works well for Flying Pie. It’s very practical, for one, because people bring in family and friends when it’s their day, and they end up making purchases in addition to the free 10” pizza. Secondly, it earns them a lot of word-of-mouth. 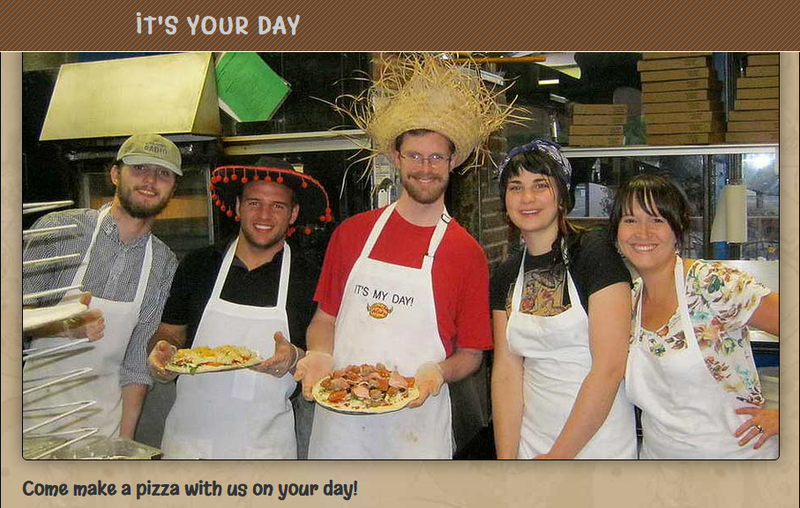 Marketing spend is equal to the cost of the pizza, a cost that already figures into regular operations. 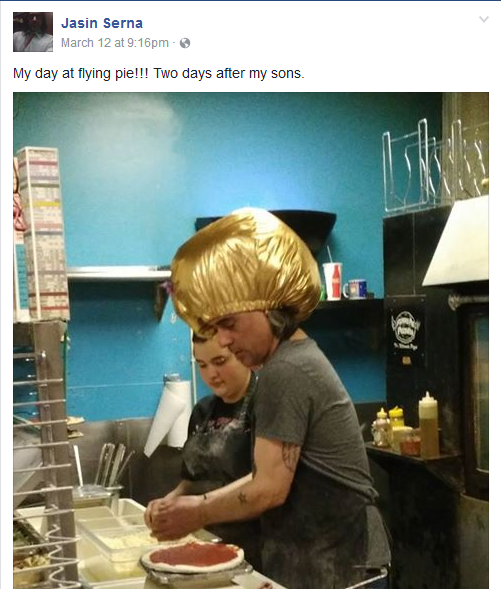 No wonder Flying Pie has over 24 thousand likes on Facebook and competes well with national chains. On your website, give the visitor who is just looking to a chance to find out more via email. This typically takes the form of the email newsletter. The visitor who doesn’t buy can become a lead if they opt to receive an email from you. It’s important to be effective with your subsequent email marketing efforts. Personalizing your emails can result in 26% more opened messages, while segmentation can yield 760% more revenue. To personalize, ask the right questions on the sign-up form. Ask about things like age, gender, and interests. To run segmented campaigns, separate recipients, into demographic categories and tailor your messages accordingly. Embedding video in your email can yield 2-3 times the click-throughs and can increase conversion rates by up to 51%. If you create a video for emails, get the most out of it by repurposing the material for your website, social media, and YouTube. Sites that include video are 53 times more likely to reach page one on Google. Website visitors who come and go could end up becoming leads later on. Through retargeted ads, use your most compelling visual material and your most compelling messages on display networks and social media. Make sure new acquisitions know how much you value their business and have an easy access point to you later on. If you’re shipping them a product, consider special packaging, so when they open the box it looks like they’re receiving a gift. Online, personalize an email, ask for feedback, let them know you value their opinion. Ask them if they want to subscribe to an email list to your blog and receive updates via social media. Be hyper-vigilant when you’re responding to questions and complaints from absolutely anyone interested in your business. Ultimately, showing you care is the best way to minimize customer acquisition costs. Daniel Matthews is a freelance writer from Boise, Idaho. In 2006, he earned his BA in English with a Creative Writing Emphasis from Boise State University. Throughout his twenties, Daniel worked as a Psychosocial Rehabilitation Specialist, a marketer, and a server. In 2015 he took the plunge and became a full-time writer. Daniel believes one of the most important, if not the most important aspects of modern business is the understanding and appreciation of diverse cultures. Please find him on Twitter and LinkedIn.